Peat bogs are a repository of the passage of time. They record changes in the earth’s atmosphere and dramatic events such as ash falls from volcanic eruptions. Through careful analysis of bogs we can reconstruct the past just like we can reconstruct a crime from a crime scene. Peat bogs in Europe, in particular, provide a unique window into the effects of human industry and landscape shift due to deforestation and agriculture and even longer term shifts in climate patterns. Peat bogs are composed mostly of peat moss and usually develop in shallow lakes. 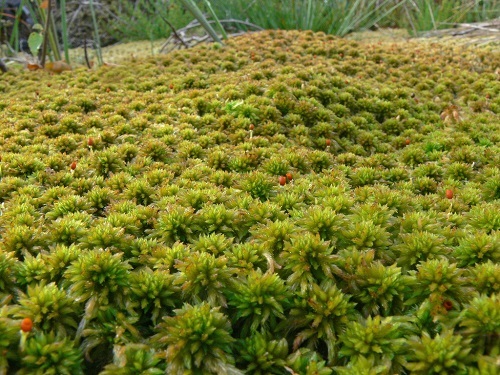 Once the peat (Sphagnum) moss starts to grow it creates a highly acidic environment that restricts the growth of most other plants. Dead peat moss builds up because it decays very slowly. As a result peat can accumulate into very thick deposits. As layers of peat build up in bogs, such as these mountain bogs in Switzerland, chemicals from the atmosphere that land in the bog become preserved in the growing peat layers. 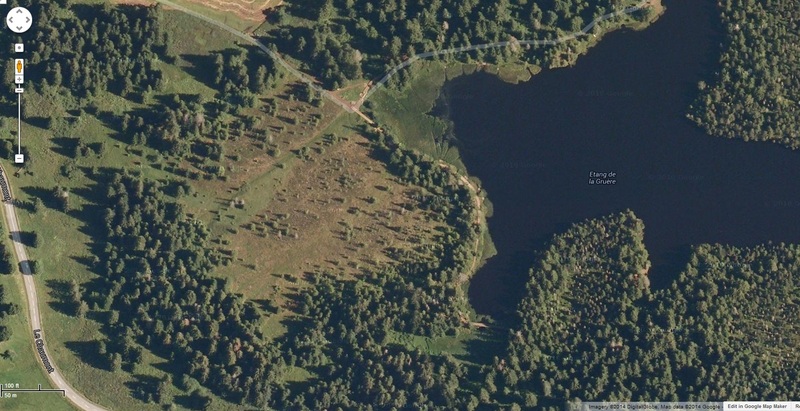 Google map image of a bog at lake Etang de la Gruere Photo. The bog is the nearly treeless area to the left of the lake. Image courtesy of Google Maps. Google is a registered trademark of Google Inc. Above is one of the bogs in the Jura Mountains of Switzerland and has been the target of several studies. Bogs develop very slowly over time and as the lake in the picture above fills in with sediment eventually the whole lake will become a large peat bog. The bog will continue to grow taller often growing up higher than the surrounding land. Eventually this will attract other forms of vegetation which will grown over the bog. In another 10 to 20 thousand years this lake will have been transformed into a forest if not disturbed by man. The whole cycle from lake to bog to vegetation is a slow and deliberate process especially were there are very few sources of sediment input into the lake. Panorama of the bog shown in the Google map above and one of the bogs examined for metal and other chemical fallout from the atmosphere over time. Photo by Wehrlireapub on Panoramio (link to source). Significantly, as the bog is growing rare elements in our atmosphere like lead and scandium become preserved in peat layers as they rain down on the surface of the bog. The amount of these elements in our atmosphere is effected by the amount of rock exposed at the surface of the land since it is erosion of that rock that leads to these elements getting into dust in the air. In the case of lead, the natural processes of adding lead to the atmosphere are greatly augmented by human production of lead. So what was found in a bog in Switzerland? Scientists drilled down into the center of a bog in Switzerland producing a 6.5 meter core of peat. They then took small pieces of that core every couple of centimeters and carefully measured the amount of a number of many rare elements as well as performing 14C radiocarbon dating on organic material. What they observed was that lead concentrations varied greatly over the length of the core which they attributed solely to the influence of lead falling from the atmosphere. As expected the 14C calculated ages showed the bottom of the core to be the oldest (12,000 years) with values scaling gradually down to the present at the top of the core. But what is really interesting is that concentrations of elements from a depth of 145 cm which were dated at 3000 14C yr before present (eg. about 1000 BC), to the top of the 650 cm core can be readily correlated with the record of lead production over the past 3000 years. There are different forms of lead and one of them is produced in higher amounts during the process of making lead products. The lead “industry” began about 3000 years ago which increased the total amount of lead in the atmosphere and one form of lead in particular. So what is observed in this bog in Switzerland is the unmistakable signal of when human lead production began and that occurs only 145 cm below the present surface of the bog. Therefore we can infer with a great deal of confidence that the 400+ cm of peat below this point were produced prior to 1000 BC. What about the scandium (Sc – element 21) in the peat core? Scandium is a relatively rare earth element but does constitute a small component of most rocks. Lead is also found in most rock but at somewhat higher concentration. The important thing to remember is that the ratio of lead to scandium is fairly consistent and so natural erosion of rocks and the resultant dust entering into the atmosphere should result in the same ratio of lead to scandium wherever that dust lands. Therefore, scandium acts like a control for this study. There was no scandium industry until the last decade and so any scandium found in the atmosphere would just be the result of natural processes until very recently. What is observed in the peat cores is that below 145 cm in the core the lead/scandium ratios are just as predicted based on natural levels but above 145 cm the lead increases but the scandium does not – as expected. This is additional evidence that the advent of the lead industry about 3000 years ago and the subsequent release of lead into the atmosphere is responsible for these changes in the peat core. Lead, silver and other metal production has varied greatly over recorded history with massive production during the time of the Roman Empire followed by a much lower amount afterward until the industrial revolution. Lead hit its highest concentration just before leaded gas was banned in the late 1970s. All these changes in lead concentrations in the atmosphere have be observed in this peat core. Figure 1 from Shotyk et al Science 1998 paper (see refs). Lead and scandium levels are traced across two peat cores. The third column is he ratio of lead to scandium. Note the C14 dates on the right side. The calculated14C dates of each of these events in the Swiss bog correlates well with the dates for these events as they are understood from other archaeological and historical records. Hence, the observed lead concentrations in the core provide independent confirmation of the validity of 14C dating over at least the past 3000 years. Going further down in the core, 14C dating of gives a date of 12,370 yr BP for the bottom of the core. Altogether the dates along with the amount of peat produced between the dated times suggests that rather uniform rate of peat production occurred over the entire period. 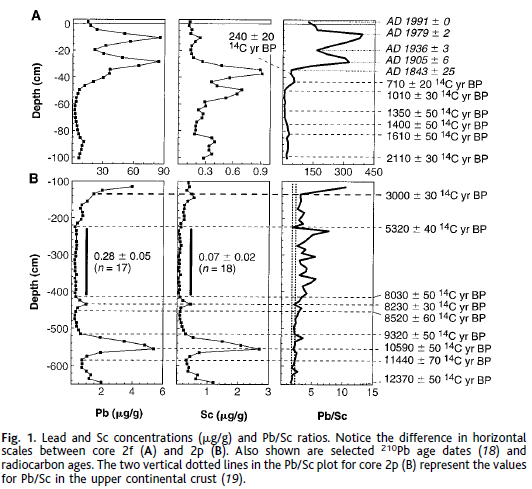 Lead concentrations increase, though the ratios of lead isotopes and the Pb/Sc ratio do not change, at 220 cm which is dated at 5320 year before present. This is thought to be the result of the first occurrence of agriculture in the surrounding regions and deforestation resulting in increased release of dust into the atmosphere. Near the bottom of the peat core, there is a large peak at 520 cm that was 14C dated to 10,590 years before present. This corresponds well with a time called Younger Dryas which is a well-known period in the northern hemisphere when the climate turned much drier for hundreds of years resulting in massive increases in the sizes of deserts around the world. This would have increased the total amount of lead and scandium in the atmospheric though in similar ratios just as are seen in this peat core. This spike in elemental abundance in this core has been observed in sediment cores, peat cores and ice cores all over the Earth all of which are 14C dated to the same age. Because well-understood historical events are recorded in the top 145 cm of this 650 cm core, it seems natural to ask what happened during the deposition of more than 3/4 of the peat in this bog below this point. Both 14C dates and the estimated peat production rates over 3000 years suggest at least 12,000 years was required to produce this peat deposit. As I said before, peat bogs are a repository of the passage of time. As such they present yet another challenge to the view of young earth creationists that these bogs were all formed in less than 4500 years. We can clearly see here that 3000 years of Earth’s chronology are all squeezed into just the upper 145 cm of this core. Below 145 cm the lead ratios are just what would be expected had there been NO lead production. Young earth creationists (YECs) should find this peat core profile very perplexing because it includes a long period of time (400 cm of peat growth) during which the no elevated lead was found. In the YEC worldview man had smelting technology right away and clearly must have been mining lead just hundreds of years after Noah’s flood. Where then is the missing human produced lead from this time period? There is no current model of a young earth that would place the observed evidence of the origins of this bog near the time of a global flood. Rather the bog would have originated at least several hundred years after the flood, due to the age and nature of the lake sediments lying below the bog and the origins of the valley in which the bog is found. Therefore, the production of over four meters of natural lead bearing peat would need to be compressed into a period of far less than 1000 years. Remember, the physical position of these bogs as isolated, raised mounds leaves virtually no opportunity to have materials transported into them from anywhere but the atmosphere. Examination of the entire core demonstrates that when the effects of anthropogenic (human) sources of lead are eliminated, the amount of atmospheric influx of lead has been nearly constant throughout the entire core (except for two short periods around 520 and 400 cm which were natural lead influxes). Lastly, it is important to know that the observed pattern of changes in lead concentrations in this core have been shown to be correlated with similar patterns in other bogs and lake sediment records in Europe and the Greenland GRIP ice core. All of these observations collectively present a compelling case that there these geographical features of the Earth experienced a long history prior to modern man arriving on the scene. This doesn’t leave much room for a YEC view in which man quickly populated the whole earth and especially Europe only a few hundred years after a global flood. This article is an update of a short piece of wrote many year ago entitled “Carbon 14 and Lead Deposition” for PSCF (Perspective on Science and Christian Faith). As the time I was commenting on an article published in Science entitled: “History of Atmospheric Lead Deposition Since 12,370 14C yr BP from a Peat Bog, Jura Mountains, Switzerland” available HERE. The article reported measurement and interpretation of lead (Pb) and scandium (Sc) concentrations in a vertical core obtained from a peat bog in Switzerland. *This post has been updated since it last appeared on Naturalis History Jan 10, 2014. Not as much discussion about how peat affects the flavor of Jura scotch whiskey as I’d have liked, but good article all the same!